We will be adding new listings every couple of weeks to our store so please check back often! If you have any questions, please do not hesitate to contact me! This listing is for a truly stunning antique hand painted Limoges Porcelain Peacock Pitcher Tankard hand signed by the artist and dated 1915. The piece is signed JPL France and L Barbour (unsure if this is exact spelling) 1915. The pitcher is just shy of 12 inches tall by 5 inches wide on the top opening, 6 inches wide on the base. Unfortunately, there is a crack to the handle and possible reglue situation. Please see the photographs of the handle. The rest of the pitcher is perfect. A beautiful piece, I wish it didn't have the damage, but it does. Also listing another JPL hand painted pitcher tonight. Do not miss your opportunity to add this piece to your home or collection! 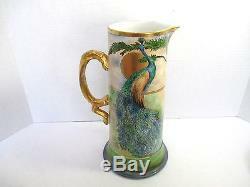 The item "Beautiful 1915 Large Limoges Porcelain Hand Painted Peacock Pitcher JPL Signed" is in sale since Tuesday, July 7, 2015. This item is in the category "Pottery & Glass\Pottery & China\China & Dinnerware\Limoges". The seller is "hotalibl-buyitnow" and is located in Morristown, New York. This item can be shipped to United States, Canada, United Kingdom, Denmark, Romania, Slovakia, Bulgaria, Czech republic, Finland, Hungary, Latvia, Lithuania, Malta, Estonia, Australia, Greece, Portugal, Cyprus, Slovenia, Japan, China, Sweden, South Korea, Indonesia, Taiwan, South africa, Thailand, Belgium, France, Hong Kong, Ireland, Netherlands, Poland, Spain, Italy, Germany, Austria, Israel, Mexico, New Zealand, Philippines, Singapore, Switzerland, Norway, Saudi arabia, Ukraine, United arab emirates, Qatar, Kuwait, Bahrain, Croatia, Malaysia, Brazil, Chile, Colombia, Costa rica, Panama, Trinidad and tobago, Guatemala, Honduras, Jamaica, Antigua and barbuda, Aruba, Belize, Dominica, Grenada, Saint kitts and nevis, Saint lucia, Montserrat, Turks and caicos islands, Barbados, Bangladesh, Bermuda, Brunei darussalam, Bolivia, Ecuador, Egypt, French guiana, Guernsey, Gibraltar, Guadeloupe, Iceland, Jersey, Jordan, Cambodia, Cayman islands, Liechtenstein, Sri lanka, Luxembourg, Monaco, Macao, Martinique, Maldives, Nicaragua, Oman, Peru, Pakistan, Paraguay, Reunion, Bahamas, Viet nam.